[From ONLY $1.3m] Cairnhill Nine in Orchard Is Ready For Viewing! 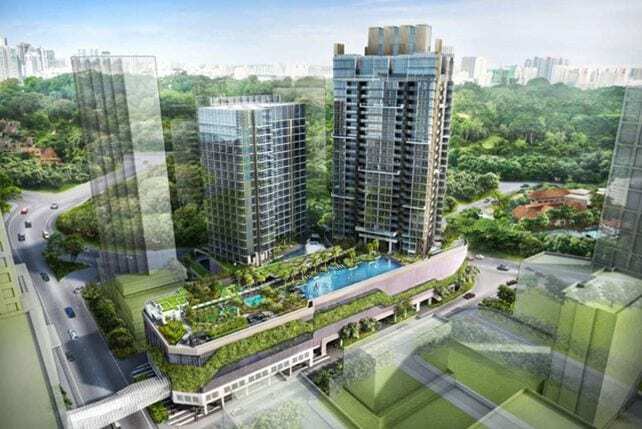 Property giant CapitaLand’s Cairnhill Nine is a new launch integrated development that is poised to be one of the most fashionable living destinations in Singapore upon completion. A 99-years-leasehold property, this condo is expected to be completed in late 2017, though there is much buzz and excitement in the market for it already. Towering at a height of 122 meters at the intersection between Cairnhill Road and Bideford Road, this condo will leave an indelible mark on the Singapore skyline, further adding to its prestige and charm. From its imposing structure and brilliant location, to the host of luxuries it promises to harbour within, Cairnhill Nine seems like the next big thing to hit Singapore’s real estate industry. Standing tall in Singapore’s uber-chic District 09, Cairnhill Nine location is strategically positioned to offer its residents all kinds of conveniences and urban facilities without having to venture far. Connectivity to different parts of the city via public transportation is assured to future residents. With the Somerset MRT being not more than 400 meters away and the Central Expressway just a 3-minute drive from this development, all kinds of travellers will reach their destinations speedily. Various feeder bus services and cabs also operate in this region, for those who wish to travel thus. Cairnhill Nine is situated such that office-goers as well as those with family will be proximal to their respective places of frequentation. The Central Business District and Marina Bay Financial District are both a short drive away. For school-going children too, there are many reputed educational institutions in the vicinity. For instance, River Valley Primary School, Farrer Park Primary School, Raffles’ Girls Secondary School, Outram Secondary School, Catholic Junior College and Singapore Management University are just few of those falling within 10 km radius of Cairnhill Nine. And it is not just these daily commutes that become shorter with residency at Cairnhill Nine. Going out to fulfil one’s daily requirements and access other urban amenities cannot be anymore convenient either. For groceries and daily supplies, shopping arcades such as Paragon, Ngee Ann City Shopping Centre, Wisma Atria Shopping Centre, Tekka Market and Zion Riverside Food Centre shall be within easy reach. For luxury services and entertainment facilities like theatres, pubs, wining and dining, the numerous locales at the iconic Orchard Road, will be more than sufficient. For recreational purposes, there are plenty of clubs including the American Club and Tanglin Club, green spaces like Istana Park and Emerald Hill Conservation Area, and various other places of interest, very close by. Moreover, with the Mount Elizabeth Hospital and Paragon Medical Centre being a short drive away too, residents’ daily and emergency health care shall be easily catered to. Thus, to say that Cairnhill Nine shall be considered one of Singapore’s prime addresses on account of its brilliant location is something of an understatement. Future homeowners will find themselves enjoying the hustle, bustle and activity of the city’s downtown area. In so far as the living environment within the condo is concerned, the developers have made painstaking efforts to ensure that the resident maintains a lavish lifestyle. From the innovative architecture and opulent interior design to the vast plethora of recreational facilities, Cairnhill Nine guarantees its residents the best experience of high-class living. Each unit is to be designed such that basic comforts like fresh air, natural lighting and sufficient space are guaranteed. The interiors are to be furnished with designer-quality fitments and fixtures that enhance the elegance of each abode. Adding to the grandeur of it all are carefully chosen timber flooring in the bedrooms and marble flooring in the living/dining areas. The bathrooms are to have modern, luxurious fittings while the kitchen will have high-tech appliances by German leading companies. Each unit will have the sophistication and exclusiveness of a resort-style abode, thus ensuring residents enjoy the most splendid luxuries in their home. For further leisure and pleasure of those living here, there are numerous communal amenities you can enjoy right within the parameters of this complex. There are to be two Clubhouses; one at the 6th storey having a gymnasium, golf simulator room and music room, and another on the 7th storey having a function room, wine and cigar room, spa rooms and a reading room too. For the water-lovers and fitness enthusiasts, there will be a lap pool as well as outdoor fitness station, both well-equipped and beautifully designed. For socializing and party purposes, there shall be barbeque pits and cabanas, free for usage by residents. Thus, homeowners here need not go far beyond their abode to relax, unwind and have some fun. But it is not just residents’ recreational needs that Cairnhill Nine caters too. There is much emphasis on convenience and safety; ample parking spaces, 2 electric car charging stations, 24-hours security and concierge service is also to be provided. Clearly, the makers of this condominium have paid much attention to detail in ensuring that homeowners have every possible urban facility at their disposal and within easy reach. The Cairnhill Nine land site is spread over a whopping 114,355 square feet comprising of 220 hotel rooms operated by Ascott Singapore and 268 residential units. 1 Bedroom units covering 592 to 969 square feet. 2 Bedroom units covering 1,033 to 1,324 square feet. 4 Bedroom units covering 1,528 to 2,013 square feet. Penthouses covering 2,400 – 3,864 square feet. With a plethora of unit size options available, the requirements of all kinds of households are likely to be met. At Cairnhill Nine, there is something for everyone. The Cairnhill Nine showflat is located along Ganges Avenue, which is just opposite Emerald Park condo and minutes’ walk away from Great World City shopping centre. Be sure to check with us at (+65) 6631 8384 if the showflat is opened for viewing, in order to save you some precious time. Cairnhill Nine is undeniably one of the most awaited real estate projects in Singapore. The irresistible combination of its upmarket location and luxuriant interiors makes it an ideal investment, both in terms of asset-accumulation and as one’s not-so-humble-abode. This is probably why it has been matched up against OUE’s Twin Peaks condo within to same precinct (at Leonie Hill). However in terms of pricing, is it a worthy buy? Let’s compare Cairnhill Nine with some of the other prominent condominiums within the area. The above data and price statistics collected are for all transactions recorded since year 2015 to March 2016. And looking at Cairnhill Nine price comparison with other property projects, the price doesn’t seem to be “incredibly” attractive, especially when some neighbouring freehold properties are transacting close to Cairnhill Nine’s average PSF price. As for OUE Twin Peaks, it is definitely one of the priciest development in the precinct. Still, developer OUE remains firm on their asking prices as it stands out among its competitors by offering top-end finishings and services to its residents. And if I have to choose between Cairnhill Nine or Twin Peaks, it’s definitely going to be Cairnhill Nine. But if we were to just look at its immediate surrounding, the development is practically surrounded by freehold properties. On top of that, there will be a mosque right below the residential development at 1st floor. It’s not a prejudice against any religious places, but it’s usually a concern for property buyers due to the possibility of congestion and noise. No doubt, having a home in Cairnhill Nine is sure to be a matter of much pride and prestige for anyone and everyone. However, in my opinion, I would rather pick the freehold properties (such as the latest 8 Hullet) within the vicinity as they prove to possess more value in the long run due to the tenure, especially when the price gap isn’t that great. For more details on Cairnhill Nine, simply fill up your details in the form below. If not, you can also give us a call at (+65) 6631 8384. I would like to view Cairnhill Nine and receive priority information on this project. Thanks.